Click through to flickr - select Actions > View all sizes to see the high resolution file. 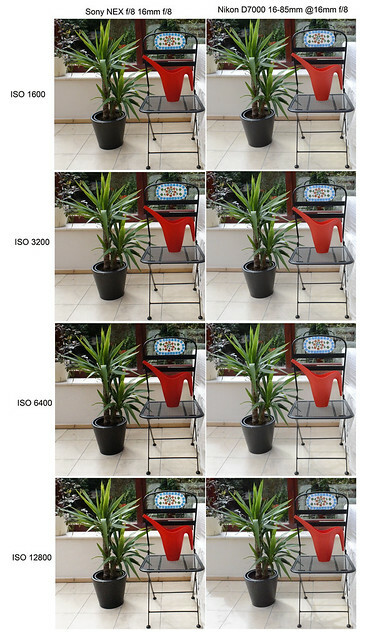 This may be the same sensor but Sony and Nikon choose to process their jpgs in different ways. From this comparison Sony appear to "process" their files somewhat more than Nikon. The comparison was between the Sony NEX-C3 fitted with a 16mm f/2.8 and a Nikon D7000 fitted with a 16-85mm zoom at 16mm. I used f/8 for each and took pictures at ISO 1600, 3200, 6400 and 12,800. These are (not very big) crops from those pictures. The Sony shots are somewhat darker in the main, and seem to have some sharpening applied. I'm not drawing any conclusions from this yet, until Photoshop ACR supports the Sony, other than to say that I'd be quite happy with either. To a certain extent it depends on what you prefer. In the rare circumstances I would use these high ISO settings, I wouldn't have a problem with either set of pictures. It certainly shows that the Sony is well able to compete with one of the best DSLR's on the market today, in terms of high ISO noise control. If you were taking a C3 to take some photographs at a wedding, for example, and didn't want to use flash, then you could be confident of getting useable results up to ISO 6400. ISO 12,800 is I think a step too far for this sensor, but its there if you really need it. Just to finish off by saying that personally, I prefer the D7000 renditions, apart from ISO 12,800, where I prefer the Sony.